Here it goes. My first ever blogpost! I expect to make a few mistakes but this should be fun! 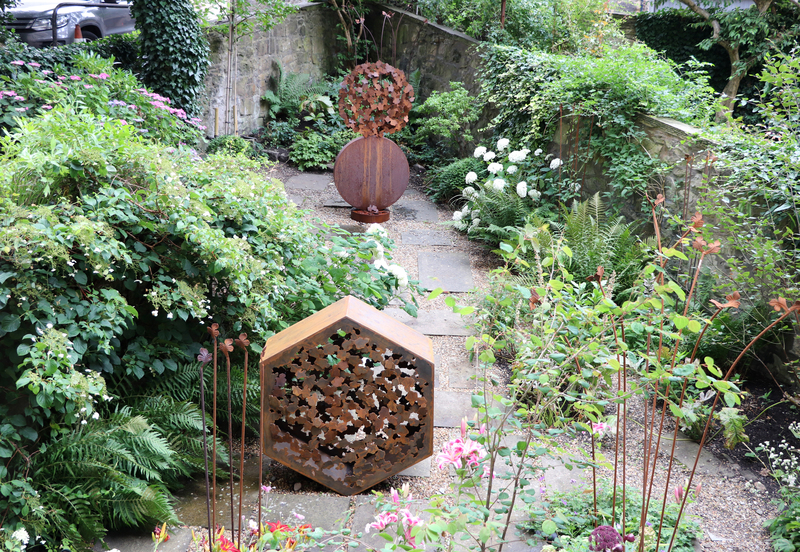 I have just installed B-Cell, a new handcut corten steel sculpture, in the back garden of The Scottish Gallery in Edinburgh’s Dundas Street. For a while I have been working on new ideas which combine my research into science, environmental and nature themes. The hexagonal sculpture stands at 124cm which is about chest high. It has been great working on this and I think there is more to come yet. Working out the maths and how they translate into steel sheet has been interesting and I would like to make it even more technical in the future. The picture also shows Demeter, Sweet Pea Stakes and Petalostia poles. New B-Cell and Demeter outdoor corten steel garden sculptures by Andrea Geile. The photo is also showing Sweet Pea Stakes and Petalostia poles.